How Do You About Feel Working in a Team Environment? To answer these questions well, you’ll need to give specific examples of how you've worked with others in the past and achieved successful results. Read below for tips on how to answer questions about working on a team, as well as sample answers. No matter how the question is phrased, you want to use examples from your past to show that you work well in a team environment. Questions that focus on examples from your past are called behavioral interview questions. Behavioral interview questions are those in which interviewers are looking for a concrete example of your past work experiences. 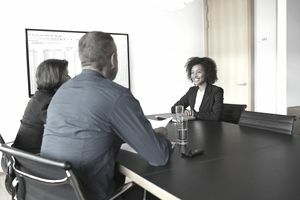 Examples of behavioral interview of questions include, "Tell me about a time you handled conflict" and "Give me an example of when you needed to solve a problem creatively.” Looking to your work history is a way for an employer to learn if you’ll be a good fit for the new job. When you’re asked about teamwork, choose an example of a time you worked in a team environment. If you don’t have much work history, you can use an example from school, a club, or a volunteer experience. Think of a specific time when you worked very well as a team player or helped achieve a team goal. Situation: Describe the context or situation. Explain where and when you worked in this particular team setting. Task: Explain the mission of the team – describe the particular project you were working on, or what kind of teamwork you had to do. If there was a particular problem in the group, explain that problem or challenge. Action: Describe the actions you took to complete the teamwork or solve the particular problem. Result: Finally, explain the result of the actions taken. Emphasize what your team accomplished, or what you learned. Also, make sure that your answer expresses your positive feelings about teamwork. Remember, the employer is asking this question because teamwork is probably necessary for the job. Be positive, but also honest. Of course, if you don’t like to work as part of a team, an employer asking lots of questions about teamwork might be a sign that this is not the right job for you. I believe that I have a lot to contribute to a team environment; I love to help resolve group issues through research and communication. For example, during planning for a major event, our team struggled to decide how to set up the room. Rather than getting into an argument about personal preferences, I did some research using event planning industry trade publications to find information on the best room setup for customer experience for our type of event. By sharing the research and the rationale, my coworkers and I agreed this was the best approach and we had a great event. Customer satisfaction was up several percentage points over the previous year's event. I enjoy working in a team environment, and I get along well with people. In my past work experience, I implemented a system to help organize the communication between my coworkers to enhance our productivity as a team. It helped us delegate tasks more easily, which led to earlier completion dates. I prefer teamwork. Different team members contribute different perspectives, and the synergy between team members can produce creative and productive results. I love to help draw out the unique skill sets of different team members. For example, I recently worked on a large group project in which one or two introverted members were not sharing their opinions with the group. I suggested breaking our large group into smaller teams for a brainstorming session. In these smaller teams, the quieter members became more vocal and shared some terrific ideas. These ideas became part of our strategy and helped us successfully complete the project. Do You Enjoy Working in a Fast-Paced Team Environment?